agh, late November. It hit me hard this year, on Tuesday morning to pinpoint it really, though it had been building all month - at least I have a couch to curl up on, baseboard heat to turn up and cats that sleep on my chest, which renders any vulnerable person immobile. And of course, movies and tv to d0wnl0ad, I mean, watch while feeling guilty about my malaise, trying to wish away my lack of will or enthusiasm for any action beyond adjusting the laptop screen so I can see it from a reclined position. I guess my wishing worked though - that and getting some work completed (but oh. so. slowly.) and also the vitamin supplements and the discovery of Les Ralizzes Denudes? Because by Friday around 3pm, I felt a distinctive return of bounce and joy. whoa, I felt lucky. Our brains are funny things. ha. ha... ha. But god, I'm glad for brain weirdness. Take last night's screening of short films at RESfest, for instance. So much fantastic weirdness and in portions fully digestible to the hibernation-driven brain. Must fight that sleepy drive, must keep going through winter, work, art, play, friends. Getting to see almost two hours of super high-quality art+entertainment is like some kind of environmentally sound, endlessly renewable creative fuel (uh, even if it did start with a Nike ad. But a really freakin great one, I'm almost sorry to say - corporate sponsorship y/n/undecided? er.). I was able to think and talk and even write again. Really great to see a large crowd out too - I'd sorta forgotten about the greatest of film festivals and the focused kind of attention these audiences give to films. Oh, and the clapping after each short! Appreciation is nice. So yeah, right off the bat we get the Nike ad, which is really a short animated film by Canadian Christopher Hutsul (made for RESfest) about a running shoe telling its history to some kind of monkey creature and some kind of hot dog creature (?). I don't know. I really liked it despite knowing it was an ad. What can ya do. The next time we saw the swoosh was halfway through the screening, during Johan Kramer's film, 0.08, about a boy named Victor who lives in Spain and who is almost totally blind yet plays soccer (in above company's shoes...) and does everything any 12 yr-old boy might do. The narration was a bit heavy handed but nothing that overshadowed the poignacy and beauty of the film, whose frames went in and out of focus in long-shots and close-ups that seemed to mimic the daily excitement of Victor's life and his own curiousity for it - a life that doctors had predicted would be dull and bleak. Yeah, so, haha, speaking of November blues... I needed this film to nudge me out of the ridiculous. Okay, I'm not going to chronicle in detail every film because I want to get this online so I can tell you to go see films at RESfest! Because there are lots! Another Shorts showcase Saturday at 2pm and another Sunday at 4pm! Plus more films! (please see full schedule in pdf). And music/parties too! 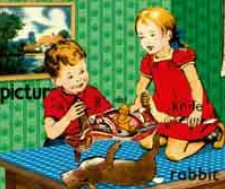 I totally adored Run Wake's Rabbit, a film that looked like a really gorgeous 1950s kids picture book, complete with words beside each object - rabbit, cow, horse, jewel, idol - wait, idol? yeah! These bratty kids on a farm kill a rabbit, which is just hopping along, c'mon! And slice it open and inside is this crazy little gold man/idol, who turns annoying wasps into jewels and ink and feathers - which of course the bratty kids (who can drive a truck btw) want more of. Turns out the idol can turn cows and sheep and horses into even more riches. Also turns out there's a moral to the story, of course. Awesome. And Emilio Ramos' Fog, while a bit wordy (i wasn't so into narration and, y'know, words yesterday, I guess), was absolutely beautiful - wooly sheep in the sky in a mountain town! I've always thought that rendering fog in animation would be hard, but this filmmaker found a lovely, weird way to do it. Chris Shepherd's Silence Is Golden also made me laugh out loud, though for different reasons: kids are crazy, adults are crazy, the imagination can be a crazy place to live but don't we love it anyway? Though I don't really want to lose my mind, please, not completely. Ah, and then Pes' Game Over took up the theme of food-in-action again, recreating video games like Frogger (how many hours of my life did you take, Coleco-vision? how many?? ), Pac Man and Space Invaders. Right, and how could I end this summary without mentioning the importance of music in this festival and how crucial it was to all the short films. Without it, they wouldn't be complete by a long shot (see what i did there). yaay RESfest, okay okay, so I do I like you and your flashy, hip-cool ways. I think my favourite part of Food Fight was when the hamburgers and the beef stroginoffs kept amassing more hamburgers and stronginoffs in what was obviously an allusion to the bloated posturing of the cold war. Talk about cold left-overs. I'm also glad that my peoples were represented by shish kebobs, compared to other foods, they looked pretty damn tough. I acquired more new thgins on this fat loss issue. 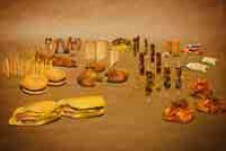 One issue is a good nutrition is especially vital while dieting. A massive reduction in junk food, sugary food, fried foods, sweet foods, beef, and white-colored flour products could possibly be necessary. Holding wastes parasitic organisms, and wastes may prevent targets for losing fat. While specific drugs quickly solve the issue, the horrible side effects are usually not worth it, and so they never offer more than a short-term solution. This is a known fact that 95% of celebrity diets fail. Thanks for sharing your ideas on this web site.